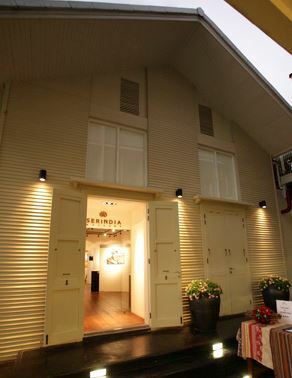 Serindia Gallery is a fine arts and photography gallery located near the Chao Phraya River. From website: Serindia Gallery, a gallery of fine arts and photography, is located in a 60-year old post-colonial style home in the neighborhood of the Mandarin Oriental Hotel and the French Ambassador Residence by the Chao Phraya river. "Serindia" means the silk road between China and India -- a term coined by past archeologists to designate a vast stretch of land west of China from Xinjiang all the way west to the Middle East and down to the Himalayas and northern India. It is a place rich in the confluence of culture, history and art, and Serindia's books and arts reflect these rich cultures and religions. Serindia Gallery continues the tradition of its Serindia publishing brand into a gallery of fine arts and photography. It represents international artists from Europe, America, and Asia. Works include oil and watercolor paintings, woodblock prints, and fine art photographs.